Jag har lääänge tänk att jag en dag måste virka ett överkast och äntligen har jag kommit igång! Hurra! Bestämde mig för att göra ett klassiskt överkast men ville ha något lite extra eller annorlunda. Tillslut blev det denna glada och färggranna retro vibe-ruta som fick äran 🙂 Jag har valt att virka i dubbelt acrylgarn för att få en lite tjockare och fastare struktur samtidigt som det inte blir för tungt. For long I have been thinking about making a bedspread and now I’m finally on my way! Yay! Decided to make a classic crocheted bedspread but wanted an extra touch to it. Eventually I decided to use the happy colourfull retro vibe square 🙂 I make this bedspread with double acrylic yarn to make it a little bit more thick and sturdy but not to heavy at the same time. Scheepjes Colour Crafter är ett 100% premium acrylgarn som kommer i 100 g-nystan om 300 m. Det är mycket mjuk och varmt. Mitt garn kommer ifrån Favoritgarner. 1002, 1422 , 2012 , 1062, 2014, 1116, 2016, 2006, 1083, 1123, 1828, 1080, 1067, 1263, 1114 and 1711. Jag vet inte vilken garnåtgång det blir ännu eftersom jag inte är klar ännu / I don’t know the amount of yarn I need yet since I’m not done. This is awesome. Vibrant and fun. Thank you for sharing. Really love your pattern and colors. Can you tell me the size of each square? What a BEAUTIFUL pattern !!! Thanks for sharing !!! Härliga färger. Så vackert med blommönstret. 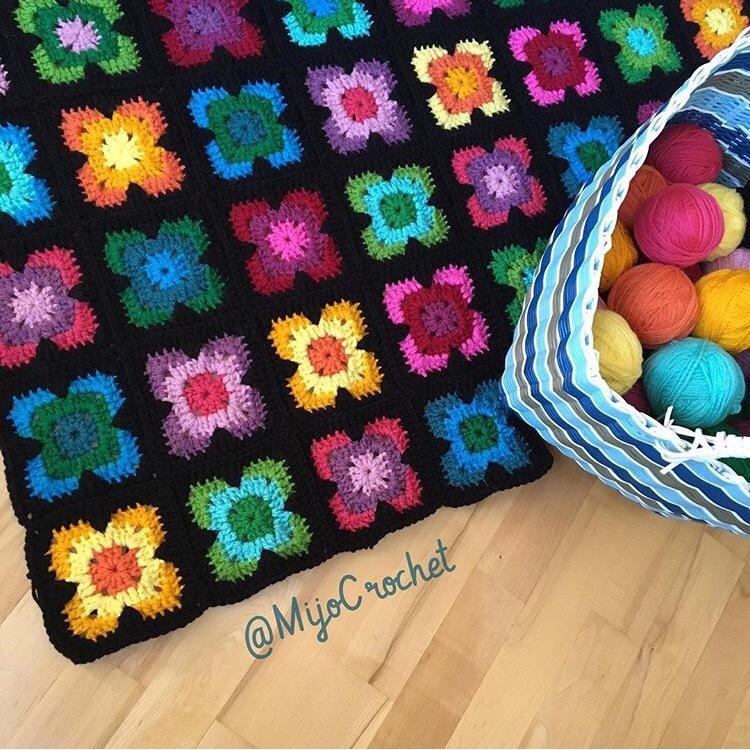 Very pretty,thank you for sharing the pattern. Hello from Cincinnati, Ohio, USA. I am 71 years old this week & I have decided to make all your patterns. You are so generous, talented & creative & take so much time to write them out so precisely & simple to print. I really love the color changes, for example, on the tips of flowers, which make them POP! Thank you so much for the opportunity 2 learn new stitches, shapes & color changes. I appreciate knowing you from far away! Wow! Thank you so much for this lovely message ❤ This made my day! Im so happy to ba able to inspire, and of course I get even happier when someone takes their time and write to me. Hi! Row1: 3 dc/side. Row2: 4 dc, 2 2dc.tog and 1 ch/side. Row3: 10 dc, 1 ch/side. LOVE this so much!!! Ty for sharing! Can you please translate into English?? A great big hello! Thank you so very much for sharing your talent and patterns with others on the internet. It is very generous of you to take your time to carefully write out each pattern and supply us with all the information necessary to make each of your patterns. I am very aware you do not have to do this and cannot express in words how very kind you are to do so. Thank you so much. Your generosity is greatly appreciated. Your work and color combinations are stunning! I will keep checking back for your post about how much yarn you ended up using when you complete this Retro Vibe bedspread you are making. Cheers to you! This is great! I am making this blanket with the colors of each square based on a specific Grateful Dead poster/postcard from the 1960s! It is for someone who has a collection of posters AND a Yorkie! Wow! That sounds amazing 😀 I would love to see it some day. Will post a photo when I am finished, but that may be a while! I am trying to discipline myself to work more slowly so that I don’t aggravate my tendonitis! I have finally finished my “Fillmore Auditorium Poster” version of your afghan pattern! It isn’t very large but it is very colorful, and will serve its purpose! I am happy to send you a couple of photos of it if you let me know how to do that. Thanks again for the pattern! I had a lot of fun using it. Hi! 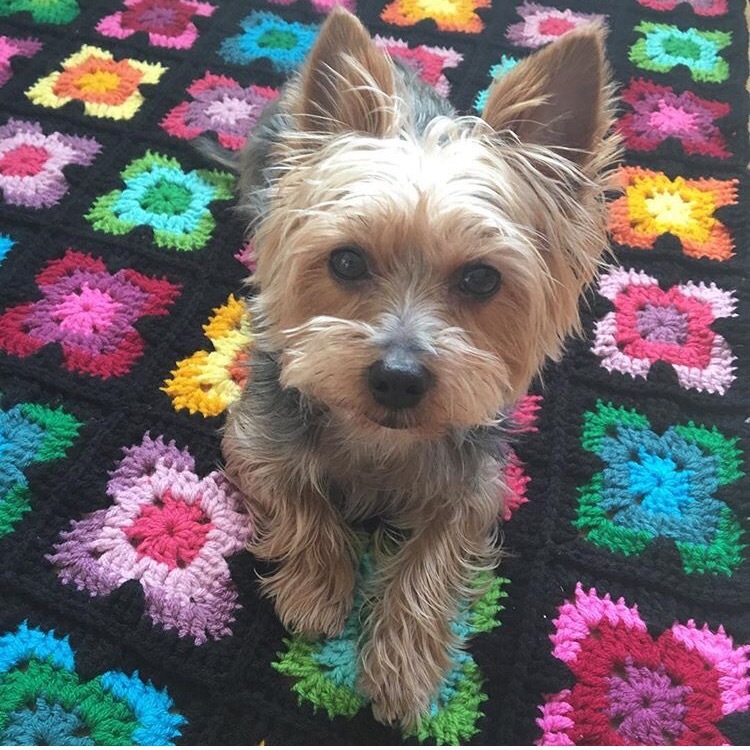 I have been crocheting for around 20 years now. I’ve decided to use this pattern and make my mom a queen size blanket for the first time! Do you have a suggestion for the border? I cannoy get to the pattern. Just keep going in circles trying to get to the pattern. It is beautiful and I would love to try it. Can you send me link to this pattern? Thank you! I just bought a pattern from you but I cannot find the pattern? I love bright colours ! – and I love squares that are interestingly different. 😀 If I were not right now involved in 2-colour lace briohe, I would start on this. Thank you very much !, with regards from Downunder. Love your happy message from Downunder 😄 Thank you! Love ALL your patterns. Got issues opening this one, it downloads and opens 1x, the next time I try to open it denies access staying it is DRM protected. I suspect it is the photos? Oh thank you so much ☺️I actually have no idea what DRM protected means 🙈It works fine when Im opening it on my partners computer. Thank you so much. I have a lot of stash yarn and this is just the correct pattern. I would just like to know how do you join the squares please. I finished your pattern using colors from a big collection of Fillmore Auditorium posters and postcards. If you let me know where to send you a photo, I will do so!